The calico sling bag has similar dimensions to the long handle calico bag and the short handle calico bag, but it features a long handle for carry the bag over your shoulder, or by carrying the bag diagonally across your body across the opposite shoulder. The calico sling bag is popular with schools as library bags, and distributing business-related promotional material. Please note, the calico sling bag does NOT have a gusset. The reason is relatively simple, calico fabric doesn't tend to hold its shape, the fabric tends to sit flat or hang like a sack when in use. 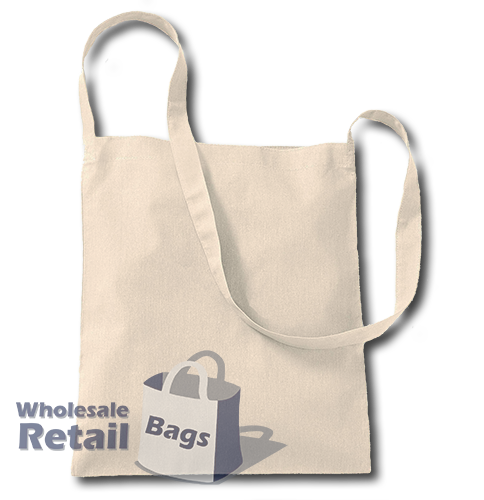 For a bag with a gusset that will hold its shape far better, we recommend the nonwoven sling bag.